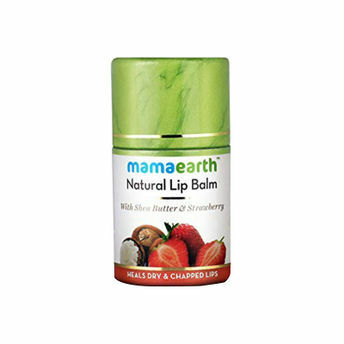 Mamaearth Natural Lip Balm is a 100% natural lip care salve that has a natural strawberry flavor. Enriched with shea butter and strawberry, this lip balm softens and hydrates your lips and helps you to achieve the perfect pout! Coconut oil and Vitamin E in it retain moisture, leaving your lips feeling smooth and hydrated. With the goodness of natural ingredients, Mamaearth Natural Lip Balm For Women With Shea Butter & Strawberry prevents extremely dry, chapped, broken or cracked lips. Packed with strawberry this balm soothes dry flaky skin while shea butter locks in the moisture and keeps the lips hydrated for a very long time. 100% natural and dermatologically tested, this balm is free from petrolatum, paraben, silicones, artificial flavour and colour. About the Brand: Mamaearth is Asia's first MadeSafe certified brand. The brand aspires to take care of every parents' and baby's well being from head to toe with safe, toxin free and international standard products. All Mamaearth products go through multiple testing processes, including clinical dermatology testing in Europe, to ensure that they are of supreme quality and suit global standards. They are all 100% natural and are made using natural ingredients such as calendula extract, shea butter, jojoba oil to name a few. Explore the entire range of Face & Body Care available on Nykaa. Shop more Mamaearth products here.You can browse through the complete world of Mamaearth Face & Body Care .